Originally this piece of land was part of the northern tip of an acre Lot #70 in the first division granted to a man named Abraham Merrill. In the late 1700s the entire 80 acres was sold to John Currier, who in 1792 turned around and resold it to Isaiah Flanders and Asa Bates. A few months later those two men decided to split the lot between them, and Isaiah Flanders ended up with the northern 30 acres. During the next few years about 88 square rods on the Main Road was sold off of this 30 acres to Caleb Watson, who in 1820 sold the property to a man named Moses Brown. To get an idea of how big this piece of land was … it more or less encompassed approximately what now makes up the Parsonage and the Better Mouse Trap (now the Historical Society) properly combined. In 1820 the heirs of Isaiah Colby sold the land (now mentioned in the deed as ½ acre) to a Joseph Brown, Jr. for $500. And then three years later, land prices having deteriorated, the ½ acre was sold to William Harwood for the magnificent sum of $200. A year later, the economy surged upward, and the land went to Daniel Savory for $310. This man, Daniel Savory, is the one who divided the property in half, selling the corner piece, later known as the Parsonage, to a Benjamin Pearsons in 1834. In 1850 Daniel Savory sold this piece of land that the Historical Society has just purchased, with the buildings, to Cyrus P. Savory with the stipulation that he, Daniel, would retain use and control it until his death. Although this 1850 deed is the first in which a building is mentioned, it is believed the house was built by Daniel Savory shortly after he bought the land in 1833. 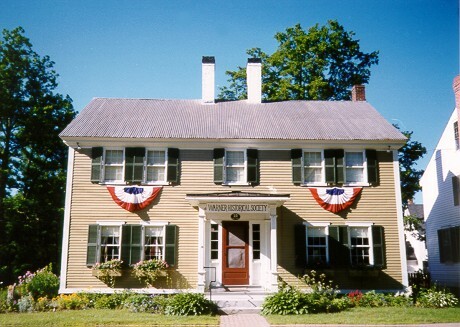 The house was purchased by the Warner Historical Society in 1982 with the generous donation of Mary Martin.